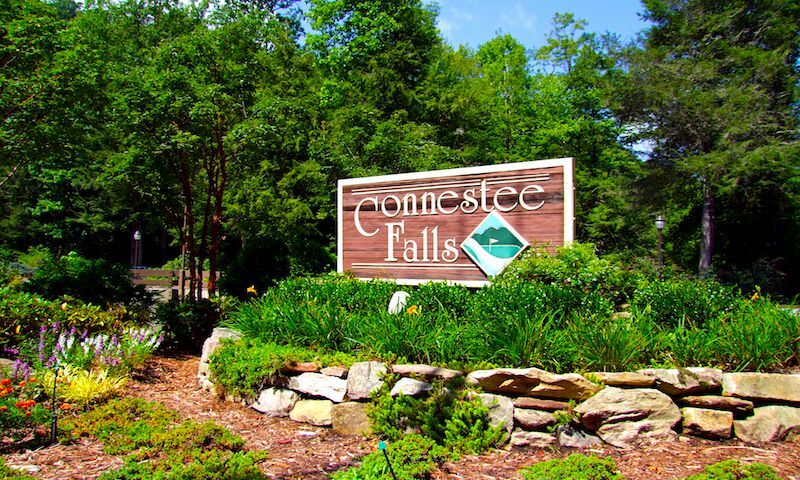 Connestee Falls is an active lifestyle community in Brevard, North Carolina. Homebuyers flock to this gated master-planned community because it provides an ideal mountain setting along with resort-style amenities and beautiful homesites. It also offers a vibrant and welcoming atmosphere where like-minded adults can be as active and engaged as they wish. With a long list of clubs, activities, and events, residents will have a hard time keeping their social calendars free. Ideally situated in Transylvania County, just outside the mountain college town of Brevard, residents enjoy a quiet and picturesque rural environment as well as easy access to everyday conveniences, healthcare facilities, and attractions. Connestee Falls offers a diverse and rich combination of resort-style amenities for all residents to enjoy. At the heart of this community is the Overlook Clubhouse, which provides 26,000 square feet of recreational space. Homeowners have a spacious banquet hall, dining room, and meeting rooms that are great for small or large functions. Residents stay in shape by utilizing the cardiovascular and strength training equipment in the state-of-the-art fitness center. Neighbors can catch a live show at the performance theater, play games in the card room, or join a book club in the library. A sports grill, lounge, and bar are perfect for casual gatherings with friends in an inviting atmosphere. A pro shop helps golfers get the latest gear before their next tee time. Outdoors, residents have a heated pool for swimming laps or relaxing on a sunny day. An outdoor patio is convenient for getting some fresh air and taking in the scenic views of the neighborhood. Homeowners looking to stay active can challenge their neighbors on the pickleball, bocce ball, or tennis courts. They can also spend time in the community garden and plant produce. The community's walking and biking trails provide 13 miles of pathways for leisurely strolls or hikes around the picturesque area that features lakes, waterfalls, and parks. Construction of Connestee Falls began in 1972 and it will have 1,300 residences upon completion. Homebuyers have plenty of options to choose from in this age-targeted community including attached homes and single-family residences. Buyers can select from new or resale inventory or they can custom-build their dream home on various homesites. There are a variety of attached homes within Connestee Falls. They range in size from approximately 1,200 to 3,000 square feet and have two to four bedrooms, two or three bathrooms, and attached one or two-car garages. Some homes feature hardwood floors, vaulted ceilings, stainless steel appliances, custom cabinets, and inviting living areas. Homebuyers can choose from a great selection of new and resale single-family homes. These detached residences offer approximately 1,300 to more than 5,000 square feet of living space. They have two to five bedrooms, two to four bathrooms, and an attached two or three-car garage. Many of these mountain homes offer scenic views of the natural landscape as well as open layouts, gourmet kitchens, formal dining rooms, luxurious master suites, and plenty of storage space. All residents come together in this social and vibrant age-targeted community. There are more than 60 clubs for homeowners to join that cater to a variety of interests. Like-minded adults share various hobbies and activities such as camera club, chess club, golf association, table tennis group, computer workshop, line dance, ladies bridge, and much more. Card enthusiasts will have endless choices to keep their game nights busy with pinochle, Mah Jongg, duplicate bridge, and hand and foot. Pet lovers can join the dog-owner group and spiritualists can relish in Bible study group. The community also offers plenty of volunteer opportunities to help improve the neighborhood and surrounding area. Whatever your interests or passions are, Connestee Falls is sure to have a club or group just for you. Located in Western North Carolina, residents of Connestee Falls enjoy a prime location that's full of natural and cultural attractions as well as daily conveniences nearby. Highway 276 is close by for getting around town quickly. A quick 20-minute drive to downtown Brevard provides a variety of restaurants, retail shops, gas stations, banks, government offices, and grocery stores. The area also features annual events, festivals, and venues that keep residents active and entertained such as the Scenic 276 Fine Arts & Crafts Corridor, which is a 13-mile stretch of galleries, shops, and studios. The renowned Brevard Music Center offers a beautiful place to listen to classical music. With more than 100,000 acres of state parks, outdoor enthusiasts will love all of the national forests and mountain terrains for hiking and biking. Dupont State Forest is just 15 minutes away and is popular for its waterfalls, large mountain lake, rivers, streams, and trails. Pisgah National Forest is about 25 minutes away and offers natural wonders as well as camping, hiking, horseback riding, and water activities. Residents can visit Hendersonville or Asheville, which are about an hour's drive away, for additional entertainment, dining, recreational activities, and attractions. When traveling farther is necessary, Asheville Regional Airport is close by and Greenville-Spartanburg International Airport is about an hour-and-a-half away. Homebuyers will love the natural environment as well as world-class amenities found in Connesstee Falls in Transylvania County, NC. The Overlook Clubhouse - 26,000 Sq. Ft. There are plenty of activities available in Connestee Falls. Here is a sample of some of the clubs, activities and classes offered here. There are a variety of attached homes within Connestee Falls. They range in size from approximately 1,200 to 3,000 square feet and have two to four bedrooms, two or three bathrooms, and attached one or two-car garages. Some homes feature hardwood floors, vaulted ceilings, stainless steel appliances, custom cabinets, and inviting living areas. Please Note: Floor plans are not available at this time. Active adult homebuyers can choose from a great selection of new and resale single-family homes. These detached residences offer approximately 1,300 to more than 5,000 square feet of living space. They have two to five bedrooms, two to four bathrooms, and an attached two or three-car garage. Many of these mountain homes offer scenic views of the natural landscape as well as open layouts, gourmet kitchens, formal dining rooms, luxurious master suites, and plenty of storage space. Please Note: Floor plans are not available at this time. Connestee Falls has a great clubhouse with wonderful amenities. The views are breathtaking and the golf course is beautiful. 55places.com is not affiliated with the developer(s) or homeowners association of Connestee Falls. The information you submit is distributed to a 55places.com Partner Agent, who is a licensed real estate agent. The information regarding Connestee Falls has not been verified or approved by the developer or homeowners association. Please verify all information prior to purchasing. 55places.com is not responsible for any errors regarding the information displayed on this website.